The first session focussed on conceptualising the governance of change. Paul Fawcett and Diego Rubio opened the panel with two thought provoking papers on policy change culminating with a discussion about ‘fast policy’ in the late modern era. Gerry Stoker and Anders Esmark broadened this understanding of the governance of change through a discussion of populism and technocracy respectively. Stoker considered populism’s challenge through the lens of governance theory concluding with a sobering set of conclusions about the future of democracy. Esmark extended the discussion with a critical analysis of behavioural insights and ‘nudge’. Using the increasingly available information and communications technology, Esmark reframes nudge as an informational, rather than behavioural turn that takes place within an era of ‘late modern technocracy’. Together these papers highlighted the long history of governance change and the temporality of innovative governance approaches and their link to macro phenomena and trends such as changing political contexts, societal demands, and technological advances. The second session of three papers introduced a greater empirical focus by exploring multi-level and local governance practices in several European countries. Sarah Ayres described the role of informal governance in shaping political innovation in the UK. Ayres argues that informal governance is an under-studied yet crucial component of the devolved system of government in the UK. Whilst it can help overcome issues of complexity and uncertainty, its ‘hidden’ nature also raises several concerns about legitimacy and transparency. Eva Sørensen and Jacob Torfing’s contribution to the session focussed on political metagovernance in collaborative spaces. Such spaces aim to create the opportunity for political leaders to engage with civil society outside the prevailing political institutions of formal committees and councils. Their paper engaged with the key question of how to democratise network governance arrangements. Finally, Alda Salomone explored multi-level governance through an exploration of the Development Pacts in Italy, seeking a better understanding of how institutional factors affect the success of the Pacts and whether collaborative governance can help to bridge the gap that can emerge across scales from the subnational level upwards. The papers in this session examined several cross-country examples of innovative governance and engaged with the prevailing question of the interface between existing governance processes and innovative governance practices. Some papers found that innovative practices challenged existing practices whilst others found that there was greater alignment and an easier coexistence. In the last session, the focus shifted to innovative governance ‘beyond the nation state’. Susana Borras described Product Development Partnerships (PDPs) that pool resources in an attempt to address the treatment and prevention of neglected diseases. When enacted effectively, PDPs can provide a transformative governance approach in addressing complex socio-technical challenges. However, the capacity of PDPs to induce transformative change is context-specific and success varies depending on issues such as interests, vision, and resourcing. Lain Dare also explored an empirical example of global governance: forest certification. Increasingly the legitimacy and efficacy of the Forest Stewardships Councils’ innovative governance approach is being challenged, highlighting the need to reconsider the governance processes used by the global forest regulator. Dare concludes that ‘slow’ governance processes are required to overcome the potential shortcomings of prevailing fast governance processes. Klinke closed the panel with an insightful paper in which he argued that rebalancing issues of global consumption will require a dramatic transformation beyond the capacity of the nation state. Any effective global governance of change needs democratic legitimation, hence Andreas Klinke argues for a dynamic multi-level governance approach that incorporates transnational public spheres, polyarchic network structures and self-governance – each of which can be observed in the global empirical examples provided by Borras and Dare. In this final session, the need for effective governance of change is acutely observed albeit with efficacy and legitimacy challenges. In bringing together these diverse papers the panel highlighted that the governance of change is a diverse, ongoing and evolving field that is fuelled by empirical cases of innovative governance and associated political leadership. 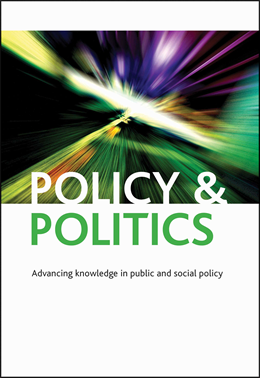 The papers in this Policy and Politics sponsored panel illustrate that innovative governance and the governance of change require sophisticated analyses that move from the abstract to the concrete and then back again: features that continue to strongly resonate with the journal’s underlying mission. If you enjoyed this blog post you may also like to read Policy learning and policy failure: definitions, dimensions and intersections by Claire Dunlop.